John J. Sosik (Ph.D., State University of New York at Binghamton) is professor of management and organization, and professor-in-charge of the Master of Leadership Development program at The Pennsylvania State University, Great Valley School of Graduate Professional Studies, where he has received awards for excellence in research, faculty innovation, teaching, and service. John J. Sosik (Ph.D., State University of New York at Binghamton) is professor of management and organization, and professor-in-charge of the Master of Leadership Development program at The Pennsylvania State University, Great Valley School of Graduate Professional Studies, where he has received awards for excellence in research, faculty innovation, teaching, and service. Dr. Sosik teaches leadership, organizational behavior, and research methods courses. His research focuses on leadership and mentoring processes in face-to-face and virtual environments, groups/teams and organizations. He is an expert on transformational leadership, having published over 100 articles, books, book chapters and proceedings and delivered 93 academic conference presentations since 1995, and has conducted training and organizational development programs for profit and non-profit organizations. His Google Scholar h-index is 52 as of July 2018. He is the recipient of the Center for Creative Leadership/Leadership Quarterly Award for his research on personality, charismatic leadership, and vision, Sage Publication’s Best Macro Contribution Award for his work on the application of the Partial Least Squares data analytic technique to group and organization research, and a grant from the National Science Foundation to study e-leadership of virtual teams at Unisys Corporation. He serves on the editorial boards of The Leadership Quarterly, Group & Organization Management, and Journal of Behavioral and Applied Management. His work in reviewing the scholarly work of colleagues in his field has been recognized by both the Academy of Management and Institute of Behavioral and Applied Management. He is the lead author of the book, The Dream Weavers: Strategy-focused Leadership in Technology-Driven Organizations (2004, Information Age Publishing). His second book, Leading With Character: Stories of Valor and Virtue and the Principles They Teach (2006, Information Age Publishing), was named one of the 30 best business books of 2007 by Soundview Executive Book Summaries, and is now in its second edition (2015, Information Age Publishing). 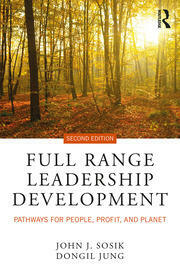 His third book, Full Range Leadership Development: Pathways for People, Profit and Planet (2010/2018, Routledge), is also now in its second edition.